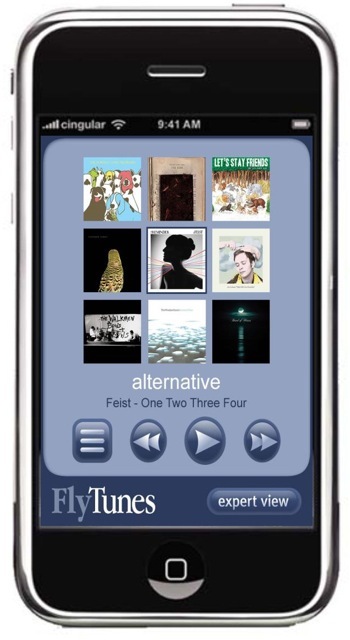 FlyTunes offers a personalized radio-like experience, with thousands of channels of digital music. FlyTunes does not require a receiver or additional hardware purchase – it works with your cell phone or personal media player. FlyTunes offers access to over 20,000 Internet radio stations. FlyTunes plays everywhere, unlike satellite radio, which does not work inside buildings, or on planes. FlyTunes allows users to personalize their music channels. While listening, users can promote favorite songs and flag unwanted ones (never to be played again). “Because FlyTunes uniquely sits between the broadcasters and the listener, it offers users personalized music, which has never been possible for satellite or terrestrial broadcasters, and the ability to cache hours of music for offline listening,” continued Abadir. Hours of personalized music can be cached to a portable media player or cell phone and listened to anywhere. Portable devices with 3G capability can cache additional music, greatly reducing battery drain. FlyTunes works with Macintosh or PC computers, and will be widely available on January 21, 2008 at the FlyTunes.fm web site. They don’t own the FlyTunes.com site, though, which is never an auspicious sign for a startup.